Kaivo, Virtual Modular Synth from Madrona Labs. 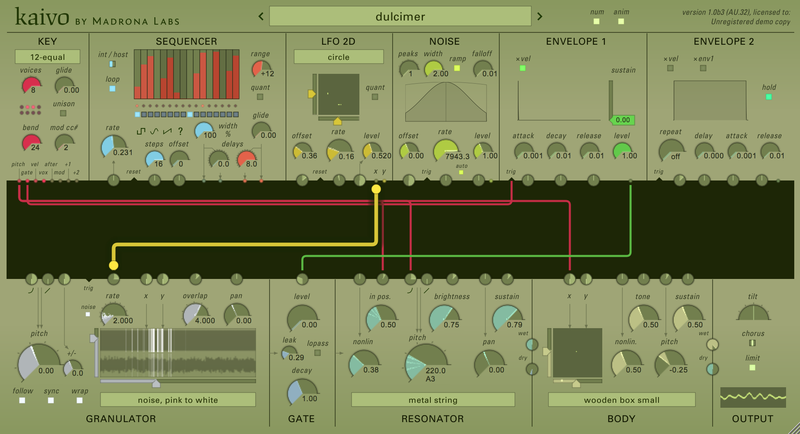 Madrona Labs announced the release of Kaivo, a new semi-modular virtual synth for Mac OS X and Windows. With Kaivo, Madrona Labs combines for the first time granular synthesis and physical modeling into a patchable semi-modular unit. Thanks to the physical modeling, you can “enter” into the synth and affect the internal vibrations at any point. The sound realism is also enhanced with the fact that every time the model is triggered, it generates a slightly different sound. Kaivo features eight types of tuned resonators (strings, chimes, springs…), as well as four 2D wooden body, two with metal plates and a frame drum. Kaivo also gives you the ability to pan at the grain, resonator and body levels, and the granulator uses a 2D map of each model with up to four channels, each body model featuring right and left pickups. The Kaivo plug-in is available in AU and VST formats for Mac OS X and Windows 32 and 64-bit, with a price of $129. A trial version can be downloaded from www.madronalabs.com. Arapolarmic monitors your mic polar pattern ARA TechLabs, a new Catalonian company, will soon launch Arapolarmic, an app that can measure and monitor the microphone directivity. 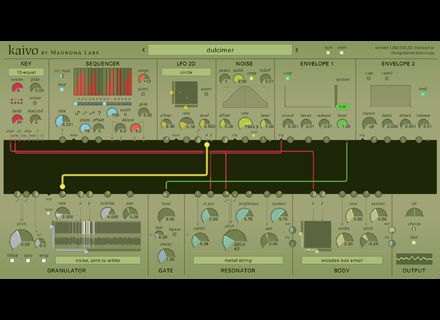 Polygon updated to version 1.1 Glitchmachines announces the release of update v1.1 for its Polygon quad sampler.